Since version 6.0.1 writing descriptions back to database is supported by the tool. This article describes a workaround for earlier versions. Thanks to the open access to our repository you can do it by yourself right now. We've created scripts that generate SQL commands adding your table, view and column descriptions to either SQL Server extended properties or Oracle DB comments. 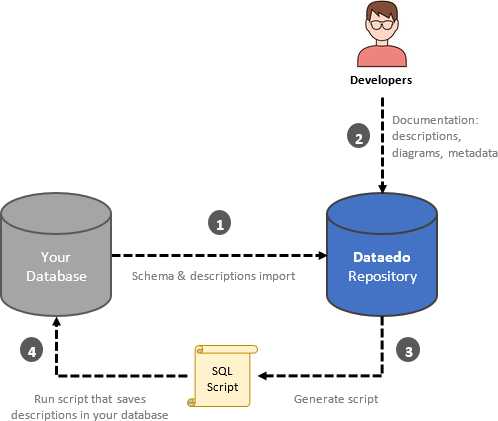 To write descriptions back to the database, first you need to copy/paste our scripts and execute it on repository database. Output of this script will contain SQL commands you would then copy and execute on your database. This script will add/update extended properties/comments. Do note that both extended properties and comments are plaintext and limited in size, so the copy will lose formatting and may be truncated. Additionally, Dataedo 5 stores a plaintext description of major objects (tables, procedures, but not columns and parameters) only in lowercase. Execute the results on your database. We tried our best to write a script for MySQL as well. Unfortunatelly, the nature of the statements that add comments in this platform are a bit dangerous. Alter statements need to include all column attributes and it poses a threat of making unwanted changes of the schema. Therefore we decided not to post a script for MySQL.